Muffins may have started out as a type of small cake or as an alternative to cornbread. Early muffin recipes tend to result in less sweet muffins with far fewer ingredients than their contemporaries. 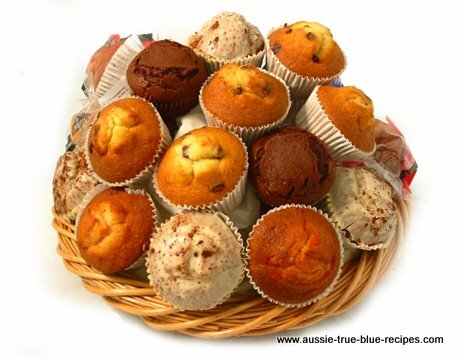 Muffins became widely used as a breakfast food because they were easy to prepare and cooked in a short amount of time. Because muffins grew stale so quickly, they were not marketed as a baked good until the middle of the 20th century. Recipes were limited to certain types of grains and simple additives like nuts and dried fruits. When paper muffin cups were invented, iron pans lost popularity and were less-widely used. Non-stick pans have allowed muffins to be baked in a variety of fun shapes to coincide with holidays and events, however, circular muffins remain the most popular. Packaged muffin mixes were introduced to the marketplace in the 1950s. Muffins went on to be marketed as an alternative to doughnuts in the 1960s. Restaurant chains featuring coffee-shop style surroundings appeared and began to feature an assortment of muffins. These days, it's rare to see a coffee shop that doesn't offer a wide selection of muffins - what gourmet coffee shop is worth it's salt, without Muffins? I have gathered many of my old recipes for sharing on this page - some have been around since my grandmother was a young mother, and others have been shared with me over the last 30 years from various women - city and country - who love to share their favourite recipes.